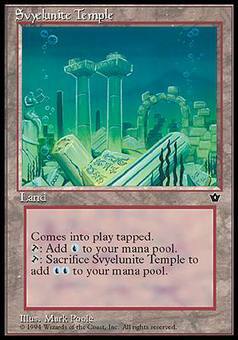 Icatian Skirmishers ($0.47) Price History from major stores - Fallen Empires - MTGPrice.com Values for Ebay, Amazon and hobby stores! 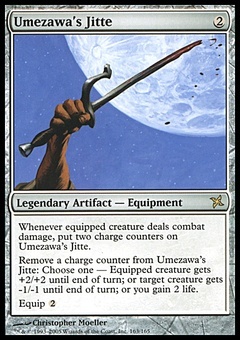 Card Text: First strike; banding (Any creatures with banding, and up to one without, can attack in a band. Bands are blocked as a group. If any creatures with banding you control are blocking or being blocked by a creature, you divide that creature's combat damage, not its controller, among any of the creatures it's being blocked by or is blocking.) Whenever Icatian Skirmishers attacks, all creatures banded with it gain first strike until end of turn. 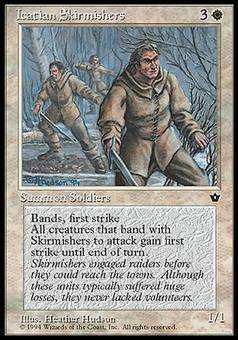 Flavor Text: Skirmishers engaged raiders before they could reach the towns. Although these units typically suffered huge losses, they never lacked volunteers.